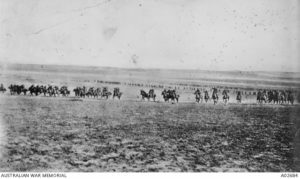 Charge of the 4th Light Horse Brigade at Beersheba, Palestine, 31 October 1917. Image courtesy Australian War Memorial. The Battle of Beersheba began at dawn on 31 October 1917 as Field Marshal Viscount Edmund Allenby led three British Divisions in an attack on the oasis of Beersheba, 43 kilometres from the Turkish stronghold of Gaza in Palestine. Located at the eastern extremity of the Turkish defensive line, Beersheba was well fortified. The Turks dug in and by mid-afternoon the Allied advance had slowed to a virtual standstill. In lengthening late afternoon shadows, one of history’s great cavalry-style charges was about to take place. But these were mounted riflemen – no swords or lances. Some slung rifles over their backs, riding bayonet in hand. Others couched rifles beneath arms, bayonets fixed, stock braced against the thigh. Their mounts were mostly ‘Walers’ – hardy, stocky, sure of foot and able to carry heavy loads long distances. The tired horses were desperate for water. Six kilometres from Beersheba, hidden from the Turks by a low ridge across a front of 1,100 metres, 800 Light Horsemen formed up. By squadrons in three lines, 300 to 500 metres apart, they were ready. Saddle-worn, overloaded and parched, the horses began to fidget, tossing their heads. They’d caught the excitement. At 4.30 pm they moved forward at a slow trot. Cresting the ridge, the formation tightened and began to canter. A kilometre on they were in a gallop, five metres apart. 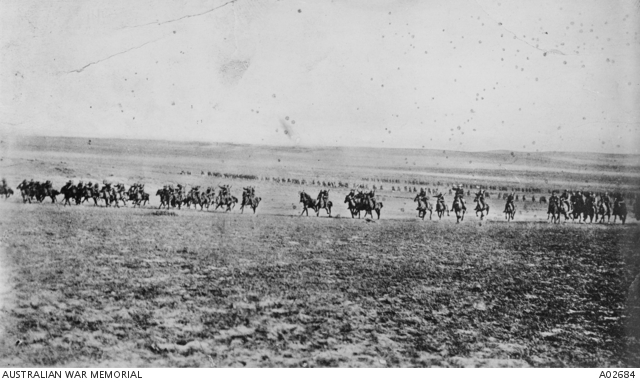 Two kilometres from the town, it was on – a reckless, headlong charge down the long gentle slope to Beersheba. The thirst crazed horses pinned back their ears and flared their nostrils, eyes widened, heads outstretched and mouths frothing, tails flying. Turkish rifles, machine guns and artillery opened fire. Bullets twitched the horses’ ears. Horses and men at the front fell. Expecting the Light Horse to stop and dismount to attack, the Turks held most fire until too late. As the first wave approached the trenches, the Turks opened up with everything including grenades. The official historian, Henry Gullet described the Light Horse sweeping over the deep, wide trenches like ‘steeple chasers’. As they did, Turks slashed at the horses’ bellies with bayonets. Some Australians dismounted and fought in savage hand to hand battles. Others rode on into Beersheba. By nightfall the town, wells, reservoirs and ammunition dumps were captured and horses watered. 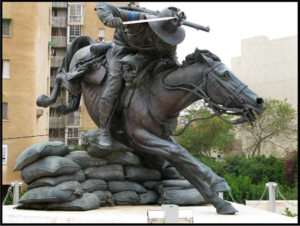 The Australian Light Horse had ridden not only into Beersheba, but to history. Seven hundred Turks were killed during the battle and 1,000 taken prisoner. The capture of Beersheba enabled British forces to break the Ottoman line near Gaza and advance into Palestine. Australia sustained relatively light casualties at Beersheba (in contrast to other battles): 31 dead and 36 wounded (and 70 dead horses). The charge of the light brigade was re-enacted in the 1939 film Forty Thousand Horsemen, starring Chips Rafferty. Director Charles Chauvel enlisted the services of the 6th Light Horse Regiment during their annual camp at Orange Showground in the making of the film. First World War veteran and prominent Orange citizen William Edwin Agland also participated in the re-enactment. Australian Light Horse Memorial sculpture by Peter Corlett, Park of the Australian Soldier, Be’er Sheva, Israel. Photograph by Howard Grey, 2010.